Please download the Singapore holidays year 2019 iCalendar format (.ics) file from the Ministry of Manpower (MOM) website. Assume you are using Microsoft Outlook 2003/2007/2010/2013/2016. In Microsoft Outlook 2010, please click File -> Open -> Import. 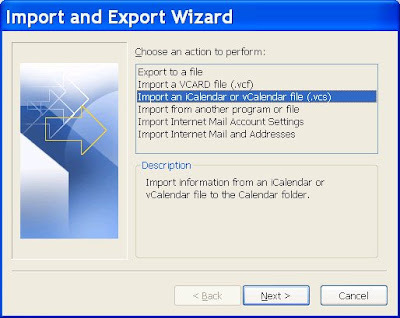 Kindly select "Import an iCalendar (.ics) or vCalendar file (.vcs) and click "Next". Kindly browse to your directory where you have downloaded the .ics file (public-holidays-sg-2019.ics) from the MOM website, select it and click "OK".